Introduction: Patterns of death after trauma are changing due to diagnostic and treatment advances. We examined mortality in critically injured patients at risk of death after discharge. Methods: We reviewed all critically injured (Injury Severity Score≥25 AND death in Emergency Room , death within 24hrs, OR ICU admission>24hrs) adults (age≥18) admitted to a Level 1 trauma center (01/01/2000-12/31/2010) and determined death post-discharge (Social Security Death Index) of patients discharged alive. We compared demographics, injury data, and critical care resource utilization between those who died during follow-up and survivors using univariate tests and Cox proportional hazards models. Results: Of 1,695 critically injured patients, 1135 (67%) were discharged alive. As of 05/1/2012, 977 (58%) index survivors were alive (median follow-up 62mos (IQR35,96)). Of 158 deaths post-discharge, 75 (47%) occurred within the first year. Patients who died post-discharge had longer hospital (24dys (IQR13,38) vs. 17dys (IQR10,27)) and ICU LOS (17dys (IQR6,29) vs. 8dys (IQR4,19)) and were more likely to undergo tracheostomies (36.1% vs. 15.6%, p16dys increased risk of death at one year (HR1.94 (1.22,3.06)) and by the end of follow-up (HR2.19 (1.58,3.04)) compared to shorter ICU stays. 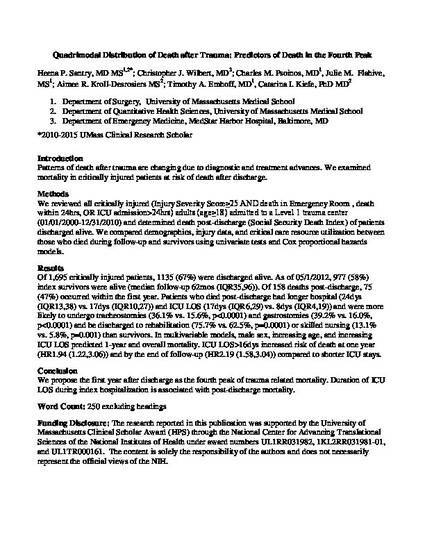 Conclusion: We propose the first year after discharge as the fourth peak of trauma related mortality. Duration of ICU LOS during index hospitalization is associated with post-discharge mortality.